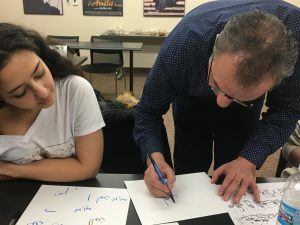 Our Arabic program at Loyola University Chicago was honored to welcome well-known Chicago-resident Palestinian artist, Majed Abu Ajameyeh to a special calligraphy workshop with our Arabic students In March 2018. Abu Ajameyehstudied Arabic calligraphy and music “Oud” in Palestine. He moved to the United States in 1990 and has been active in music and calligraphy teaching, performances, and concerts since then. 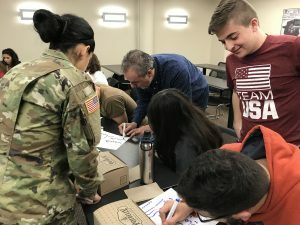 He works with several academic institutions, high schools, and Middle Eastern educational programs. 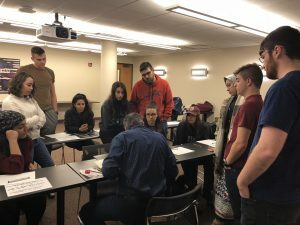 Please enjoy sample photos and selection of our Arabic students’ reflections as part of their Culture Portfolio assignments. Alyssar: I underestimated the amount of time and effort that goes into creating Arabic calligraphy. 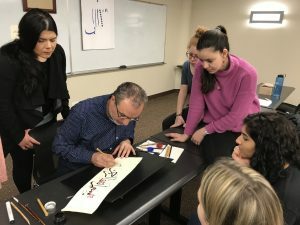 I am glad I was able to attend this calligraphy workshop because it allowed me to truly appreciate the precision and thought that goes into writing every single letter in Arabic. 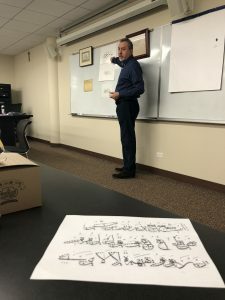 Jen: I really enjoyed having the guest speaker come into our class and explain his profession for calligraphy. I never realized how talented and skilled his was by having this ability to write so beautifully. I try really hard, especially when I am turning in an assignment to write legibly as well as to the best of my ability. I was also very interesting in hearing about his life, especially that his parents were originally from the city of Jaffa. I wrote in my most recent culture portfolio about a movie and its main character was also from there, so it was great that I was able to make a connection there. Veronika: Once again, the art surrounding the Islamic and Arab world never fails to amaze me. After being exposed to Ebru Art last semester, I was stunned by the beauty of the art; same goes for the calligraphy that was presented by the Palestinian calligraphist. The practice of Arab calligraphy is truly beautiful, complex, and relaxing. Sydney: The Arabic Calligraphy Presentation was a beautiful and fun experience. This was my first experience with Arabic calligraphy and I had no idea how much time, effort, and study it took to perfect this art. I love the fact that every stroke is intentional and structured. The fact that the letters are measured in the artist’s mind, instead of with a unit of measure is extremely impressive and inspiring. I am truly interested in learning more about Arabic calligraphy in the future. 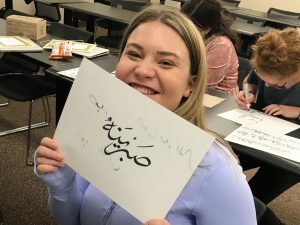 Amy: I was surprised to learn how involved and time consuming the process for making the Arabic calligraphy was, because it looks very smooth and connected, but the process used to paint the letters is broken up. It was lovely to get to see the different tools that are used in the process of making the calligraphy, and I am grateful to be able to experience this. Andrew: I found the calligraphy presentation to be incredibly interesting! As someone who has only studied Western languages, I haven’t really had much experience with artistic writing styles. The closest I’ve ever really come is cursive, which is hardly interesting compared to Arabic calligraphy’s attention to detail, shape, and size. I’ve always understood that writing can be more or less stylistic, but the idea of mathematical beauty that seems built into Arabic calligraphy is really interesting to me. 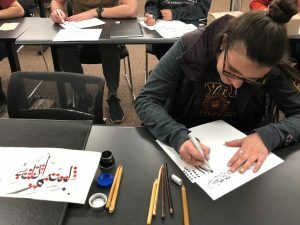 Carter: I had seen a fair amount of Arabic calligraphy before, but until Thursday I could not have imagined the time, effort, and practice that are required to create this art. Honestly, I thought that calligraphers were just people that had great motor skills and excellent handwriting. I had no idea it was such a carefully calculated art. I thoroughly enjoyed the demonstration and I am very grateful for my calligraphy pen! 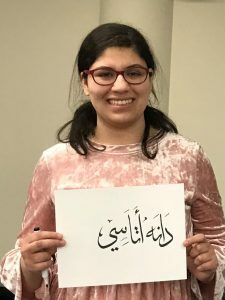 Sadina: I really enjoyed learning all the different techniques that come with writing the Arabic letters. 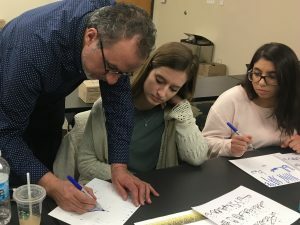 I enjoyed hearing about his background and learning about how truly hard writing perfectly in Arabic really is. Trying to write my name was very difficult, but when he wrote it for me I thought it was beautiful. Michael: I never thought about the amount of time and practice that goes into calligraphy. It’s truly amazing to watch someone who so dedicated to their craft work teach us how to do it, too! 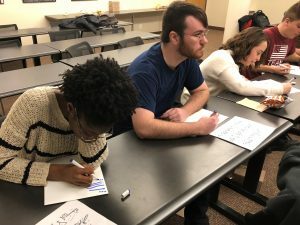 Xhenete: i had some prior knowledge of Arabic calligraphy before this session however, I loved how interactive and informative the guest speaker was. I especially enjoyed learning about how the calligraphy utensils were made and how the ink was used. Overall a wonderful experience and would recommend highly to others. Arwa: Although I have been exposed to Arabic calligraphy before, I never knew how much time and dedication it took to create this beautiful art. Each letter is measured to ensure the calligraphy is proportionate to the pen used to write it. The amount of patience it takes for Arabic calligraphy is what makes it truly beautiful. 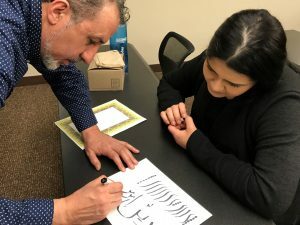 Zaira: I have seen my house adorned with Islamic Calligraphy and even though I learned the basics of it in school, I didn’t realize how much time, precision, depth and thus meaning went into the formation of each letter by a professional. 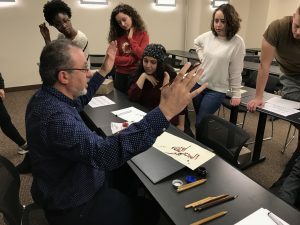 It was absolutely awe-inspiring to have a guest speaker over and it was even inspirational to learn about his life story and how he established himself as a professional calligrapher. Danah: I found the lesson on calligraphy deeply fascinating as an observer, as I realized how much intensive effort goes into each letter and word in the Arabic language to make it look as beautiful as it does, and I also observed how much dedication it takes to master the craft, and I envy those who do know how. 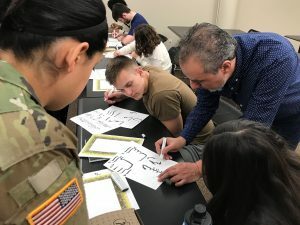 I wish we could have more time with this instructor, as he seems like a kind teacher and someone with a great deal of expertise in this field. Irene: The art of calligraphy manifests the beauty of the Arabic language. 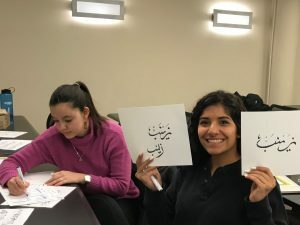 Zainab: I think this activity was very fun, and extremely eye opening to the beauty, effort and patience all involved in the creation of Arabic calligraphy! Sabrina: I am so grateful to have experienced the art of calligraphy up close to see the pure beauty of its intricate design. Alyssa: Being able to have the opportunity to learn how to do an art that has been so prominent in a culture for thousands of years is an experience that is truly amazing. I was not aware of the mathematical precision it took to do the lettering and seeing how easily the instructor did them was remarkable. I found a new appreciation for a person who has chosen to dedicate their life to preserving such an important art and appreciate all him and people like him do to preserving a culture. 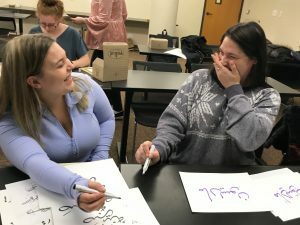 Madison: Calligraphy is a beautiful, mesmerizing, complex, and therapeutic form of art that I am now fascinated with. 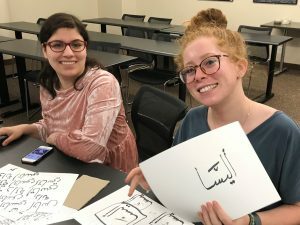 Mary Ann: It was an incredible experience to learn about the complex system behind Arabic calligraphy and to be able to attempt it myself! Bahaa: Learning the proportions of Arabic calligraphy was incredible! 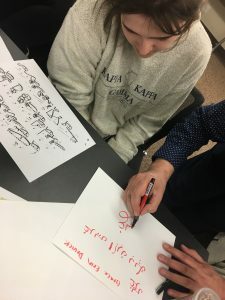 Ilse: The comparison of calligraphy to music was very interesting and finding out that most calligraphers are musicians and vice versa was something new and interesting I learned! It truly is an art form that can be admired as such. Clair: I loved learning more about Calligraphy and how serious of an art it is, I never knew that when a teacher dies their best student makes their headstone. I really enjoyed learning all about this. 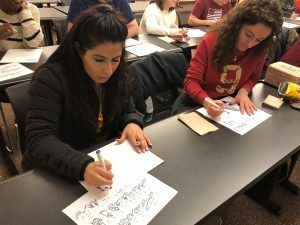 Diana Warda: I liked learning that Arabic calligraphers have to travel to different parts of the world just to be able to get the necessary tools and supplies to be able to make their beautiful art! It was also cool to learn that he had to get some supplies from China as well, which shows that every culture is tied together somehow. Grace Devick: I had an amazing experience that I honestly wasn’t expecting. Going into it I knew it would be hard, but I didn’t anticipate the exact math that has to be incorporated, and I also didn’t expect that I would be able to somewhat do it. The way the ustaadh went around the room and helped every individual student write their name was not only educational, but also so much fun! 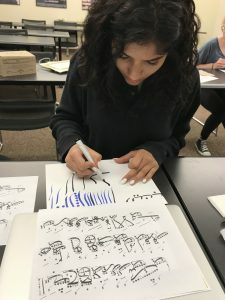 Diana Ahmad: It was very interesting to see how Arabic calligraphy is done firsthand, and I thought the methods used to create such beautiful strokes was a lot harder than it looked. 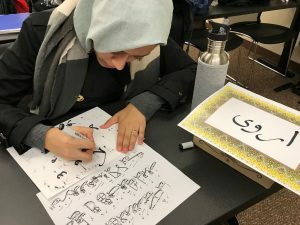 Sheema: After watching the Arabic calligraphy demonstration, I learned how the diverse art styles reflect are to reflect distinct regions in middle east they were developed in and typographers who founded specific techniques. Lynn: The amount of care put into every step, from the way the papers and pens are made to the way in which the letters are measured using periods or dots. Arabic calligraphy is an art form that requires patience, dedication, and most of all care in every step of the process.